One year into the program, the outlook is positive. California’s cap-and-trade system weathered legal challenges and demonstrated a successful launch and viability during its initial year. Much of this post is excerpted from the Environmental Defense Fund's California Carbon Market Report. The AB 32 Scoping Plan identifies a cap-and-trade program as one of the strategies California will employ to reduce the greenhouse gas (GHG) emissions that cause climate change. This program will help put California on the path to meet its goal of reducing GHG emissions to 1990 levels by the year 2020, and ultimately achieving an 80% reduction from 1990 levels by 2050. Under cap-and-trade, an overall limit on GHG emissions from capped sectors has been established by the cap-and-trade program and facilities subject to the cap are able to trade permits (allowances) to emit GHGs. The California Air Resources Board (ARB) has designed a California cap-and-trade program that is enforceable and meets the requirements of AB 32. The development of this program included a multi-year stakeholder process and consideration of potential impacts on disproportionately impacted communities. The program started on Jan 1, 2012, with an enforceable compliance obligation beginning with the 2013 GHG emissions and is currently authorized through 2020. Cap-and-trade is a market based regulation that is designed to reduce greenhouse gases (GHGs) from multiple sources. Cap-and-trade sets a firm limit or “cap” on GHGs and minimize the compliance costs of achieving AB 32 goals. 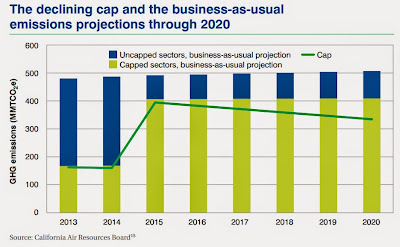 The cap will decline approximately 3 percent each year beginning in 2013. At the end of each compliance period, companies must surrender allowances back to the government sufficient to cover their compliance obligation, which is based on their emissions. Companies failing to meet compliance requirements must pay penalties, as is the case in other regulatory programs. Entities within California that has emitted, produced, imported, manufactured, or delivered in 2009 or any subsequent year more than than 25,000 metric tons of carbon dioxide equivalent (MTCO2e) per year will have to comply with the Cap-and-Trade Program. The program expands in 2015 to include fuel distributors to address emissions from transportation fuels, and from combustion of other fossil fuels not directly covered at large sources in the initial phase of the program. AB 32 Scoping Plan - Requires California to reduce greenhouse gas emissions to 1990 levels by 2020. While the cap-and-trade program is sometimes referred to as the cornerstone of California’s climate change program, it is only one of a varied suite of policies implemented to help the state reach its GHG reduction goals. Cap and trade acts as a “safety net” for California, ensuring that all necessary reductions occur to meet the 2020 target, even if the estimated reductions from other measures fall short. Therefore, the amount of reductions attributed to the capand-trade program will depend on the performance of the other policies. According to CARB’s July 2013 update to the legislature, cap and trade will provide approximately 22.5% of the reductions needed to reach 1990 emission levels. Cap and Trade provides a backstop to these other measures and ensures the overall GHG reduction goals re reached. Advance Auction Budget - Represents ten percent of the allowances from the budget year three years subsequent to the current calendar year. Since the annual allowance budget of 2017 is 370,400,000, the advance auction budget for 2014 is 37,040,000. 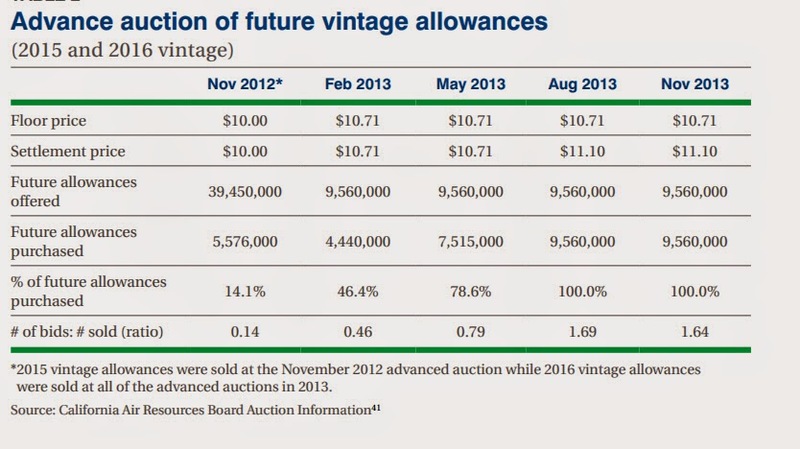 These allowances will be equally divided for sale across the four auctions in 2014. APCR - Allowance Price Containment Reserve - To ensure that prices do not spike drastically, a percentage of allowances from 2013–2020 are set aside at the beginning of the program in an Allowance Price Containment Reserve (APCR). If needed these allowances are offered for sale through a reserve auction at three pre-set price tiers: $40, $45, and $50, which also increase by 5% annually plus the rate of inflation. Once all of the allowances in the first price tier are sold, allowances will then be sold at the second tier price and so forth. These reserve auctions are scheduled to take place six weeks after each quarterly auction if requested by participants, but no reserve auctions have been held to date, as market prices have remained significantly below the lowest price tier of $40. Auction Reserve Price - A predetermined minimum price at which allowances will be sold to auction participants. The 2013 Auction Reserve Price was $10.71. Cap-and-Trade Regulation stipulates that the “Auction Reserve Price in U.S. dollars shall be the U.S. dollar Auction Reserve Price for the previous calendar year increased annually by 5 percent plus the rate of inflation as measured by the most recently available twelve months of the Consumer Price Index for All Urban Consumers.” The rate of inflation used to calculate the 2014 Auction Reserve Price is 0.936 percent. Therefore, the 2014 Auction Reserve Price is $11.34/MTCO2E. Buyer Liability - If an offset credit is invalidated because it failed to create a meaningful emissions reduction, it must be replaced by a credible emissions reduction. In the cap-and-trade regulation, CARB has placed the responsibility of replacing that offset on the firm which purchased it, otherwise known as buyer liability. Alternatively, seller liability refers to when the offset developer is held accountable for the replacement of the invalidated credit. CITISS - Compliance Instrument Tracking System Service - Provides accounts for market participants to hold and retire compliance instruments (allowances and offsets), and to participate in transactions of compliance instruments with other account holders. The CITISS account must have a Primary Account Representative (PAR) and at least one Alternate Account Representative (AAR). PAR and/or AAR(s) are the only individuals that can be authorized to bid on behalf of the entity during the auction. Account Viewing Agents (AVAs) are individuals with the capability to view an entity’s registration, account holdings, and transfer data in the CITSS. AVAs cannot edit entity information, propose to change representatives, or report the transfer of compliance instruments. Climate Credits - Small payments to customers of California's big utilities from the state's cap-and-trade system. The credits will appear as line items on utility bills. Handed out twice each year - in April and October - the payments will vary in size over time, their amounts calculated under a formula approved by state regulators. They will also vary among utilities, since the formula takes into account each utility's number of customers as well as its costs of complying with cap and trade. Pacific Gas and Electric Co. residential customers, for example, will get $29.81 in April, while Southern California Edison customers get $40. This year, $750 million from allowance sales will go toward the credits, according to the California Public Utilities Commission. Another $350 million will go to balancing accounts at the utilities themselves to offset the increased costs they face from cap and trade. "What we're hoping for is to engage ratepayers in the effort to fight climate change," said Mary Nichols, chairwoman of the California Air Resources Board, the state agency that created the cap-and-trade system. "It's about enlisting more soldiers in the fight." 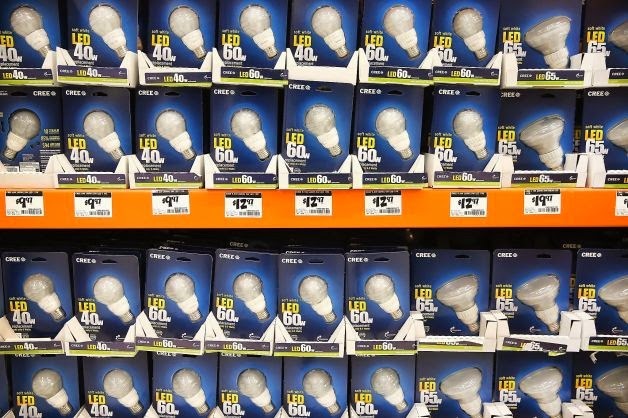 Letters accompanying April's utility bills will encourage state residents to spend their credits on energy-efficient LED lightbulbs or advanced "smart" thermostats. The letters will also direct utility customers to a website, www.energyupgradeca.org, with information on energy-efficiency rebate programs offered by the state. Covered Entity - Entities within California that has emitted, produced, imported, manufactured, or delivered in 2009 or any subsequent year more than than 25,000 metric tons of carbon dioxide equivalent (MTCO2e) per year will have to comply with the Cap-and-Trade Program. The program expands in 2015 to include fuel distributors to address emissions from transportation fuels, and from combustion of other fossil fuels not directly covered at large sources in the initial phase of the program. VAE - Voluntarily Associated Entity - Any entity which does not meet the requirements of a covered entity or an opt-in covered entity and that intends to purchase, hold, sell, or voluntarily retire compliance instruments. A voluntarily associated entity is not obligated to surrender any allowances or offset credits to ARB in order to comply with the Cap-and-Trade Program. 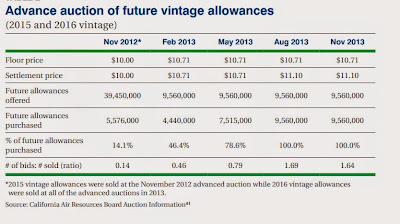 Current Auction Budget - Describes the minimum number of current year vintage allowances to be sold. This number includes the State-owned allowances (approximately 8.8 million in 2014) and the allowances to be consigned by the electricity distribution utilities (72,155,608 in 2014). Twenty-five percent of the State-owned allowances will be available at each auction. Utilities are required to notify ARB 75 days before each auction of the number of allowances they intend to consign. The total number of allowances to be auctioned in each auction will be published in the auction notice 60 days in advance. Utility allowances not consigned in the first three auctions in 2014 will be included in the Nov 19, 2014, auction. 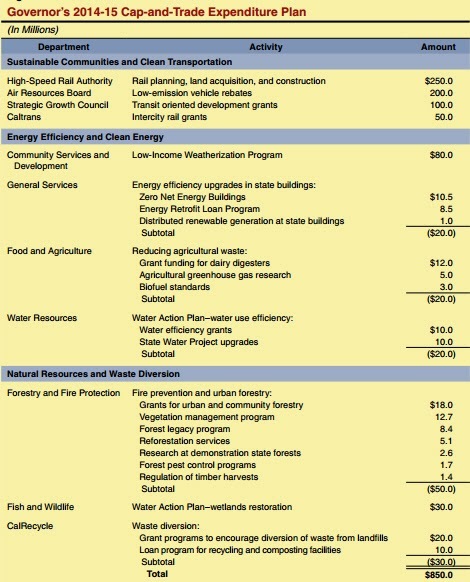 GGRF - Greenhouse Gas Reduction Fund , into which all auction revenue is to be deposited. The actual amount of revenue that will be raised is difficult to predict, particularly because of the uncertainty about future allowance prices. Several economists who have evaluated California’s cap-and-trade program have estimated that, over the life of the program, average allowance price may be in the $15 to $20 range. If this were to occur, total revenue for the program through 2020 could be roughly $15 billion. Holding Limit - The maximum number of California GHG allowances that may be held by an entity or jointly held by a group of entities with a direct corporate association. Instrument Vintage - The Current Auction will offer allowances primarily from the current vintage. The Current Auction may also include allowances from previous vintages that failed to sell at earlier auctions. The Advance Auction will offer allowances from the vintage three years in the future. Market Monitor - Works with ARB to evaluate auctions, reserve sales, and market activities. During an auction, the Market Monitor will review bidding activity and work with ARB to identify any bidding or trends of concern that may indicate manipulative or anti-competitive bidding behavior. MTCO2e - Metric Tons of Carbon Dioxide Equivalent - Carbon dioxide equivalency is a quantity that describes, for a given mixture and amount of greenhouse gas, the amount of CO2 that would have the same global warming potential (GWP), when measured over a specified timescale (generally, 100 years). Submitted bids are ranked from highest to lowest by price after close of bidding window. Qualified bids are filled until reserve price is reached or price at which total allowances sold is equal to or exceeds total allowances offered for sale. Bid evaluation and settlement price for the Current Auction and Advance Auction are conducted separately, in consecutive order. If total allowances bid exceeds total allowances offered, tie breaker process is used. All winning bidders receive the quantity of allowances they bid for at a uniform settlement price, which is determined as the value of the lowest winning bid, also known as the auction clearing price. Regardless of their original bids, all winning bidders pay the same price. Cap and Trade is an environmentally effective and economically efficient response to climate change. Trading creates incentives to reduce GHGs below allowable levels through investments in clean technologies. With a carbon market, a price on carbon is established for GHGs. Market forces spur technological innovation and investments in clean energy. According to the EDF, one year into the program, the outlook is positive. California’s cap-and-trade system weathered legal challenges and demonstrated a successful launch and viability during its initial year. In the ﬁrst ﬁve auctions, all of the offered emission allowances usable for compliance in 2013 were sold. Similarly, the secondary market for carbon allowances has shown stability, and carbon prices close to the ﬂoor indicate the long-term possibility of low marginal abatement costs for regulated entities. Contrary to some predictions of harsh economic damage, capping carbon pollution in California has occurred amidst sustained and promising economic recovery and growth, including a stronger housing market and lower unemployment rate. Allowances have sold slightly above the price floor. Low price on carbon is not necessarily a bad thing: its a sign that the market doesn't think it will be hugely expensive to reduce emissions (since the price of an allowance represents the market value of the cost of reducing one ton of carbon). Market Based - The Regulation is designed to provide covered entities the flexibility to seek out and implement the lowest-cost options to reduce emissions. Companies can purchase additional allowances beyond those they receive for free, or invest in emissions reduction projects that leave them with extra allowances that can be sold to other businesses. Support Environmental Programs - Governor Brown’s 2014-15 budget proposes to appropriate $850 million in auction revenue to various state programs, including programs related to sustainable communities, clean transportation, energy efficiency, natural resources, and waste diversion. Counter Cyclical - One reason for relatively low allowance price is the reduced demand because of the recent recession. That’s good news about the cap-and-trade mechanism because it tells us that it’s counter cyclical and that cap and trade doesn’t continue to punish the economy when it’s not necessary, as a carbon tax would. Complementary to Other GHG Reduction Measures - Another reason prices for the allowances were close to the floor price is that other AB32 measures are reducing GHGs. 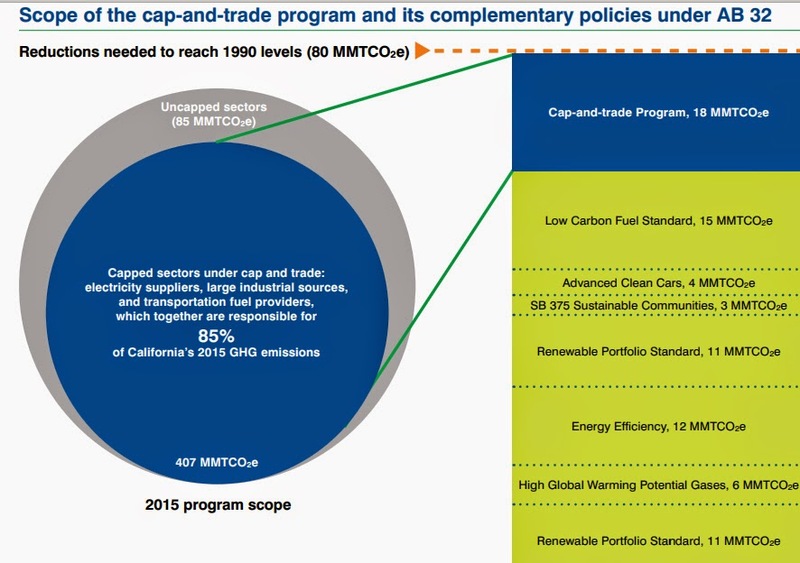 Cap and Trade is only responsible for the gap, ensuring that the overall target is met. Incentivizes Corporate Behavior Change - One of the most important thing in a cap-and-trade program or any other carbon pricing environment is that behavior changes, and behavior is changing. Companies are treating power differently; they’re planning long-term industrial facilities differently. They are taking into account a carbon price internally when planning, which they didn’t have a year ago. To me, that’s success. Potential High Compliance Costs - The average price for allowances auctioned so far suggests that achieving the cap may be less costly than some expected. Some critics of the program, including regulated businesses, have expressed fear of high compliance costs from AB 32. The reality of current allowance prices—just over $11—is in stark contrast to those fears, and shows that the cost of emissions reductions will be much lower in this ﬁrst compliance period than previously expected. Even if prices hover above the ﬂoor, the cap ensures reductions will be met and that companies will incorporate the cost of carbon into their strategic planning. Threats from Litigation - A number of prior and ongoing court challenges have added uncertainty to California’s carbon market, but so far the courts have upheld cap and trade. Offsets challenge -In 2012, Citizens Climate Lobby and Our Children’s Earth Foundation challenged the use of offsets and charged that CARB’s adoption of four offsets protocols under California’s cap-and-trade program violates AB 32. In Jan 2013, a state trial court released a decision in favor of California, offering unequivocal support for the legality of the offsets portion of the program. Our Children’s Earth Foundation appealed the decision in California’s First Appellate District; briefing was ongoing as of date of publication and as of early 2014, ahearing date has yet to be scheduled. Auction challenge -The day before the first auction in November 2012, the California Chamber of Commerce sued CARB, arguing that the agency did not have authority under AB 32 to hold auctions and that auctioning allowances resulted in an illegal tax. In Feb 2013, Morning Star Packing Co., a regulated entity, and other small businesses represented by the Pacific Legal Foundation, filed a similar suit that was considered with the Chamber case. In November, the Sacramento Superior Court found that CARB does have authority under AB 32 to hold auctions and that California tax law does not impose a restriction on auctioning allowances. An appeal in the case is expected. It is also possible that even if ultimately determined to be a fee, the courts would put limits on how the revenues can be used, just as all other state fees have spending constraints. Final decisions from the appellate courts on these issues would likely take years. Low Carbon Fuel Standard (LCFS) challenges: In 2010 and 2011, ethanol and oil interests sued CARB in both state and federal court over the state’s LCFS. Although the LCFS is a separate regulation from cap and trade under AB 32, the LCFS is expected to reduce the carbon intensity of fuels sold in California by 10% by 2020, and therefore have a significant impact on statewide emissions. Furthermore, the LCFS lawsuits involve general issues of state authority and regulatory process – both of which relate to the state’s cap-and-trade regulation. Currently, both state and federal LCFS cases are ongoing, though as of Dec 2013 significant rulings have been made in both courts allowing the LCFS to continue toward implementation. Additionally, in July 2013, the state Court of Appeal in Fresno found that errors had occurred in the process of adopting the state LCFS and ordered CARB to correct such errors, which is underway. As a result, additional administrative procedures have been implemented during adoption of cap-and-trade amendments to ensure compliance with regulatory process requirements. The potential cost burden of buyer liability and the risk of credit invalidation as perceived by would-be purchasers. A belief in the long-term persistence of low carbon prices in the program as a whole. Out of State/Ineffective Offsets - One reason development of offsets has been slow is that they are tricky. They are intended to moderate the cost of compliance, but they have a lot more wiggle room than do allowances. Some argue that the upshot of offsets is that money will flow from California businesses to out-of-state green companies. One common offset, for example, is municipal tree-planting. So long as cities plant more trees than they cut down — even if they were already doing that — they can sell an offset credit to a refinery. Instead of meeting emissions targets, companies can finance such tree-planting, regardless of whether more trees are planted than would have been otherwise. Another offset allowed in California is the installation of equipment to trap methane emissions from manure stored on dairy and swine farms. With this offset too, the credit can be taken even if the farms actually would have installed the equipment anyway — something they have an incentive to do because they can make money from this practice by using the methane to produce energy. Planting trees, even in California, is problematic as a way of reducing the state's carbon emissions. For one thing, once a tree is planted, there is no guarantee how long it will live, and some tree-planting operations are not all that concerned with a new forest's longevity. Trees release carbon when they die from fire, disease, natural decay or timber harvesting — but the oil, coal and gas they were meant to offset can't be unburned. It is even worse if the trees are planted, as is now allowed, far away from California — which means that the state's residents, who have to endure the excess pollution of the company buying the credit, don't benefit from the offset. In SB 1125, introduced in February 2014, Sen. Ricardo Lara (D-Bell Gardens) has proposed an amendment to the state climate bill that would limit the use of offsets to those "originating and achieved within the state." Various Uncertainties Make It Unlikely Proposal Will Maximize GHG Reductions - In order to minimize the negative economic impact of cap-and-trade, it is important that auction revenues be invested in a way that maximizes GHG emission reductions for a given level of spending. Maximizing emission reductions reduces the demand for allowances, thereby putting downward pressure on the price of allowances. This, in turn, reduces the overall cost for covered entities to comply with AB 32, which reduces the potential costs that would be borne by consumers, businesses, energy ratepayers, and the economy at large. 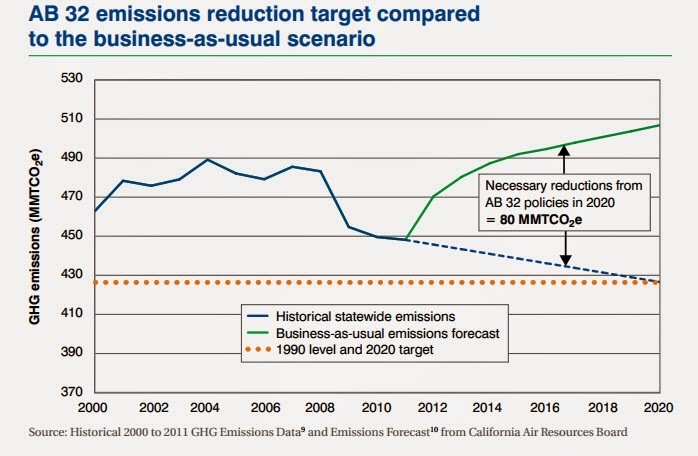 According to the California Legislative Analyst, , there is significant uncertainty regarding how much emissions would be reduced by the administration’s proposed investments, thereby making it unlikely that the total package of activities proposed by the Governor would maximize GHG emission reductions. High Speed Rail - If the proceeds from allowance sales is not used to reduce California GHG's, then the cost of each allowance will be higher. Investment in high speed rail investment will increase GHG emissions in the program period due to construction activities. Many question if this is the highest priority to fund. The Brown administration is proposing that beginning in 2015-16, 33 percent of all GGRF revenues be continuously appropriated to the High-Speed Rail Authority (HSRA) for the state’s high-speed rail project. These funds would support the construction of the project’s Initial Operating Segment (IOS), which is estimated to cost $31 billion and be completed by 2022. At this time, the administration has not provided an estimate of projected cap-and-trade auction revenues; thus, it is unclear how much funding would go to high-speed rail in 2015-16 and beyond. Wise Investment of Auction Proceeds - In order to minimize the negative economic impact of cap-and-trade, it is important that auction revenues be invested in a way that maximizes GHG emission reductions for a given level of spending. Wise investment of the auction proceeds will be an integral part of achieving the state’s AB 32 pollution reduction goals. State auction proceeds—$533 million to date—will boost clean energy in California, improve air quality, and create jobs. California law requires that auction proceeds be invested in further reducing GHG emissions. Although the goal of the cap-and-trade program is not to raise money, this ﬁrst year of auctions has shown that a meaningful amount of money can be generated from the sale of allowances. While Governor Brown has taken a one-time loan of $500 million from the state’s auction proceeds, he has committed to return these funds and invest future funds to cut carbon pollution. Further more, as required under law passed in 2011, at least 25% of the proceeds must be invested in a manner that beneﬁts disadvantaged communities in California that are most impacted by climate change and poor environmental quality. Several economists who have evaluated California’s cap-and-trade program have estimated that, over the life of the program, average allowance price may be in the $15 to $20 range. If this were to occur, total revenue for the program through 2020 could be roughly $15 billion. Accurate GHG Reporting - GHG reporting in California has been in place since 2008 and provides a solid foundation for the Cap and Trade Program. Market Certainty - The ARB has adopted regulations to keep auction prices within a certain range by setting a minimum and maximum price for allowances sold at auctions—from $10 per ton of emissions to $40 per ton of emissions. 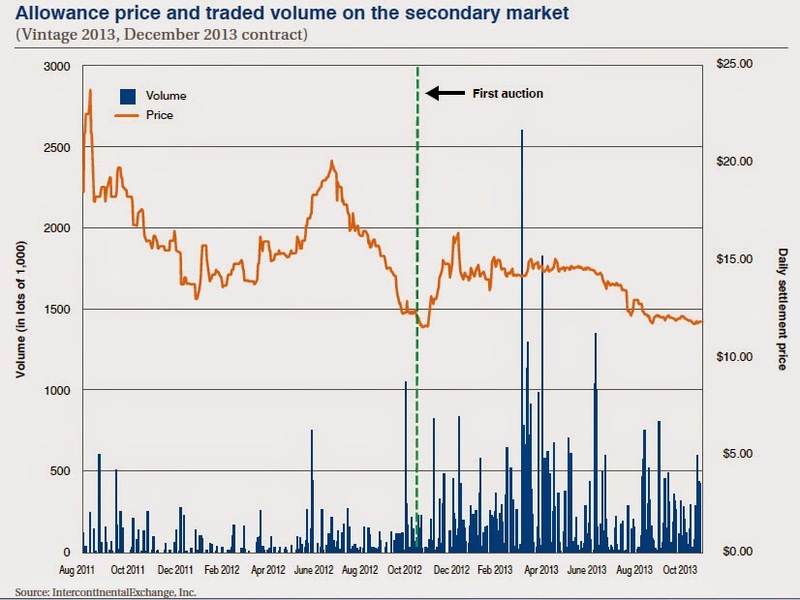 Liquidity - High volumes mean a relatively healthy market. The reason why it is important that volumes are trading is because when you have market participants who want to transact, liquidity isreally what they need. 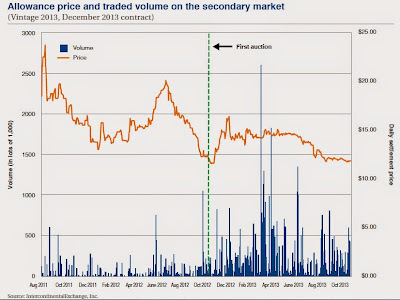 Therefore, a better measure of a healthy market is liquidity as opposed to price. Linkage with Quebec - California and Quebec formally linked their cap-and-trade programs beginning on Jan 1, 2014 and joint auctions are planned for later this year. The Quebec linkage expands the market and provides regulated entities greater ﬂexibility in meeting their compliance obligations cost-effectively. More importantly, it paves the way for other linkages which could create greater environmental and economic beneﬁts. Quebec’s program, nearly identical in design to California’s, came into effect on Jan 1, 2013 with approximately 80 facilities from the industrial and power generation sectors covered during the first compliance period. According to the Quebec cap-and-trade law, the province’s target is to cut GHG pollution to 20% below 1990 levels by 2020.67 This mandate is deemed by observers as very rigorous considering that as of 2010, 97% of Quebec’s electricity came from renewable sources, the vast majority from hydropower. With minimal reduction opportunities in the electricity and manufacturing sectors, most of Quebec’s pollution cuts are expected to come from the transportation sector, primarily cars and trucks. Like California, Quebec will allow for compliance entities to use offsets to meet up to 8% of their compliance obligation, although only three offset protocols have been approved by the jurisdiction so far: a manure storage facilities protocol, landfill sites protocol, and ozone depleting substances protocol. Given the small number of approved protocols, as well as the imitation that projects under two of the protocols can only come from within the borders of Quebec and projects under the third only from within the borders of Canada, the province s not expected to generate a significant amount of offsets in the first compliance period. Due to both the limited reduction potential and limited offset pool, it is projected that Quebec will be a net buyer of allowances from the California cap-and-trade program, though only in modest quantities. In addition, with a population of 8 million and a 2020 regulated emissions cap of 54.7 MMTCO2e, compared to California’s population of 38 million and a 2020 regulated emissions cap of 334.2 MMTCO2e, Quebec represents a much smaller market than California. Information sharing and reporting by regulated entities. Market rules which may inhibit secondary market trading and liquidity. Continued market oversight has resulted in a list of proposed cap-and-trade regulation amendments scheduled for consideration in spring 2014. One such amendment includes maintaining the integrity of price containment mechanisms, including credible offsets. Offsets, banking, and other cost containment mechanisms will continue to be important features of the cap-and-trade program. 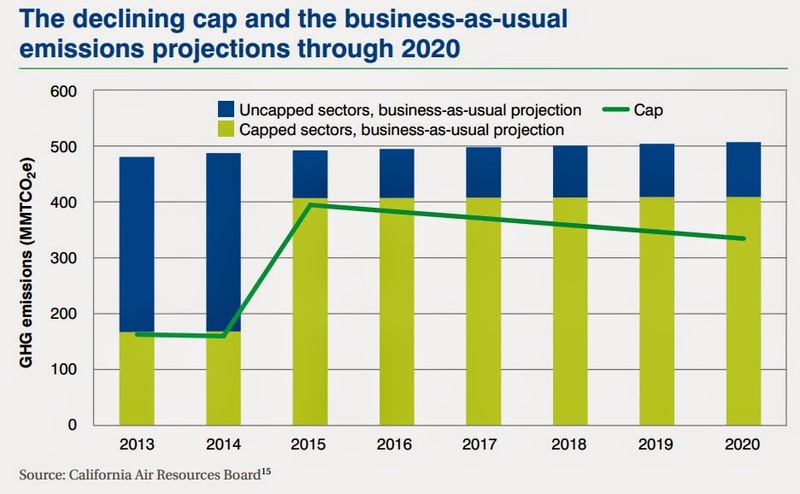 Fuels coming under the cap in 2015 - The cap more than doubles in size to include distributors of transportation fuels and natural gas on Jan 1, 2015, the start of the second compliance period. Under the current regulation, suppliers of transportation fuels will not receive any free allowances, meaning they will be required to purchase allowances to cover their emissions. This will signiﬁcantly impact the supply and demand outlook for carbon allowances. Post-2020 goals - Cap and trade, in combination with complementary measures like the Renewable Portfolio Standard and Low Carbon Fuel Standard, are keeping California on track to meet 2020 reduction targets. However, California must set post-2020 goals in order to provide regulated entities with certainty moving forward. With legal challenges mostly overcome and regulated entities showing stronger demand for future vintage allowances, California is seeing more conﬁdence in the longevity of the market. Conversations about setting a 2030 carbon pollution reduction target have begun and it is crucial for policymakers to think about post-2020 program design elements to ensure more ambitious reductions can be met at reasonable costs. Post-2020 goals should and will be set fairly soon. It is very important for the market to know that the program will continue and to know what the target will be. As we get closer to 2020, if there is no price signal beyond 2020, then prices will definitely fall. In February 2014, Senators Fran Pavley and Ricardo Lara proposed a bill requiring the Air Resources Board to provide re commendations on post-2020 climate pollution reduction targets including for short-lived pollutants. SB 1125 reflects Lara's long running concern for residents in the state's most disadvantaged communities, where air quality tends to be worse. It emphasizes the need for the state to cut not only carbon emissions, but also its output of pollutants like black carbon and methane, which not only impact global warming but also have put the San Joaquin Valley, Los Angeles, San Diego and Sacramento out of compliance with the Clean Air Act. Acre, Brazil and Chiapas, Mexico - In 2010, Governor Schwarzenegger and representatives of Acre, Brazil and Chiapas, Mexico signed a MoU that led to the establishment of a working group to provide guidance to California on fighting tropical deforestation and carbon pollution around the world through innovative policies that Reduce Emissions from Deforestation and Degradation (REDD).86 The working group examined design elements, including legal and institutional aspects and social and environmental safeguards, to develop a jurisdictional scale REDD credit trading system that could be used for compliance within California’s carbon market. Final recommendations were released in July 2013. Australia - In July 2013, Mary Nichols, the chair of CARB, signed a MoU with the Australian government’s Clean Energy Regulator to guide collaboration between the agencies in addressing the global issue of climate change. Under the agreement, the agencies pledge to share information to develop complementary and effective market-based programs to reduce GHG pollution, and support and build on the capacity of the international carbon market. The signing came before a turnover in the Australian government which resulted in a modification of Australia’s carbon policies. CARB or ARB - California Air Resources Board - Sacramento, CA - The "clean air agency" in the government of California, responsible for the design and management of the California Cap and Trade program. Established in 1967 when then-governor Ronald Reagan signed the Mulford-Carrell Act, combining the Bureau of Air Sanitation and the Motor Vehicle Pollution Control Board, CARB is a department within the cabinet-level California Environmental Protection Agency. California is the only state that is permitted to have such a regulatory agency, since it is the only state that had one before the passage of the federal Clean Air Act. Other states are permitted to follow CARB standards, or use the federal ones, but not set their own. The governing board is made up of eleven members appointed by the state's governor. Half of the appointees are experts in professional and science fields such as medicine, chemistry, physics, meteorology, engineering, business, and law. Others represent the pollution control agencies of regional districts within California - Los Angeles region, San Francisco Bay area, San Diego, the San Joaquin Valley, and other districts. China - In April 2013, Governor Brown signed a MoU with the National Development and Reform Commission of China. The MoU states that both jurisdictions agree to cooperate in “activities to implement carbon emission trading systems and other market-based mechanisms.” This MoU is the formal recognition of an extensive partnership that had been ongoing for more than a year between California and China. China is currently establishing and implementing pilot cap-and-trade programs in seven of its provinces and cities covering 250 million people. Monitoring Analytics LLC - Eagleville, PA - Independent market monitor contracted by CARB. CARB has put a number of safeguards in place to deter and detect any attempts to manipulate the market. Every market participant must register with CARB and submit to California's jurisdiction. CARB will track every transaction in the market in a central database (each allowance contains a unique serial number). Hoarding rules and purchase limits prevent any one actor from cornering the market. Market Analytics has extensive experience monitoring energy markets which are similar to carbon markets, especially in terms of analyzing the bids and activities of participants. Market Analytics won the contract through the standard, public contracting procedures used by the State of California. Markit - London & New York - Provides platform for California Cap & Trade Auctions . A leading global diversified provider of financial information services. We provide products that enhance transparency, reduce risk and improve operational efficiency. Our customers include banks, hedge funds, asset managers, central banks, regulators, auditors, fund administrators and insurance companies. Founded in 2003, we employ over 3,000 people in 11 countries. Auction and reserve sale operations are separate from the CITSS, as well as all other functions of the Cap-and-Trade Program, in order to prevent any conflicts of interest. The Auction Administrator, Markit North America, will maintain the Auction and Reserve Sale Platform (Auction Platform) and will receive required data through ARB to support the auction and reserve sale operations. WCI - Western Climate Initiative - Sacramento, CA - A non-profit corporation formed to provide administrative and technical services to support the implementation of state and provincial greenhouse gas emissions trading programs. California is working closely with British Columbia, Ontario, Quebec and Manitoba through the WCI to develop harmonized cap and trade programs that will deliver cost-effective emission reductions. Just as with other voluntary agreements that ARB establishes with local air districts, states, federal government, and contractors, ARB’s agreement with WCI, Inc. does not confer any decision making authority; decisions concerning the ARB’s cap-and-trade regulation are made by ARB at the direction of the Board. WCI, Inc. is responsible for operational services for the CITSS, such as hosting, maintenance, and help desk support. Some or all of these services may be provided through a contractor.